The simple art of drawing is often overlooked in its role in sketching the underlying outline of what later becomes a painting. Even the materials used—pencils or pastels—take second billing to the various other media in an artist’s arsenal. Nox Contemporary Gallery’s Drawn takes six local artists and sequesters them in the gallery space for eight hours on Saturday, Feb. 12, with one task at hand: Armed with only one oversized No. 2 pencil—plus one other drawing medium of the artist’s choice, attached to a dowel the length of their body height—they will each create a work on paper. It’s an intriguing lineup. 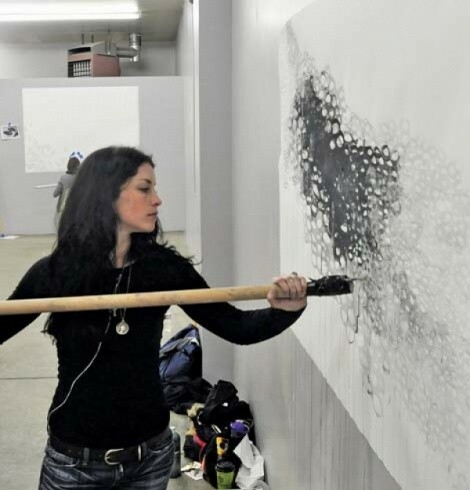 Mary Toscano is known locally for her drawings shown at Kayo and Garfo; Jenevieve Hubbard (pictured) has shown her abstract paintings at various local venues; Laura Sharp Wilson assembled The PDA Show in support of two men cited for kissing on LDS Temple grounds. “Drawn is an exploration of the art and craft of drawing—a skill that requires patience, technical mastery and intensity,” said John Sproul, director of Nox Contemporary. “The process of drawing becomes laid bare.” With an oversize instrument, it may bring back the experience of the first time they undertook the creation of art. Artists will also provide documentation of the process they underwent to create the works.